Useful tourist information for people intending to visit or holiday in Blanes which is a coastal resort on the Costa Brava coast of Spain. Blanes is the southern-most beach resort on the Costa Brava and is located in the province of Girona in the Catalonia (Catalunya) region of Spain. We also have photos, picture galleries, views, videos and webcams of Blanes so you can see what Blanes has to offer you for your holiday. We cover everything you need to know about Blanes in this tourist guide so you get the most of your visit and holiday. The Costa Brava’s most famous tourist destinations for beaches are Tossa de Mar and Lloret de Mar. Blanes is very much a different type of holiday resort. It is very popular and crowded in the summer but certainly it is smaller and therefore more relaxed for those that prefer that to the hustle and bustle of the busier and bigger resorts. Having said that Blanes is certainly not one of those tiny fishing villages with nothing to do at night. There is plenty of nightlife at the nightclubs and many hotels have free cabaret shows and entertainment after dinner in the summer holiday season. As well as being a popular place for holidays and vacations, many people from all over Europe, but especially the United Kingdom, have bought property in Blanes and live permanently in Blanes, they are known as expats or expatriates. Blanes is a popular tourist destination due to its superb sandy beaches which draw tourists from all over Europe as well as Spain. Despite its popularity for tourism Blanes retains a friendly charm which draws visitors back. The main attraction of course are the four kilometres of beaches which attract families who love to sunbathe and swim in the clean waters of the Mediterranean Sea. Most activities and things to do revolve around the beaches but there is also the old town with medieval houses, Gothic fountains, squares and churches. Blanes is very family-friendly and proud of it being the first resort on the Costa Brava to be awarded (in 2007) the Family Tourism Destination Certificate. The promenade (Passeig de Cortils i Vieta) and harbour also feature highly on the things to do and see in Blanes. The town also has a couple of pretty coves, Sant Francesc and Punta de Santa Ann. The north of Blanes is rugged with high peaks containing coves, the south of Blanes is much flatter where it meets the River Tordera. Blanes also still remains a working fishing town with one of the resort’s top attractions is the lively fish market which is held every evening in the harbour. There are plenty of activities, attractions, shopping, trips and excursions you can do when you stay in Blanes. There are many things to do and see and places to visit and explore. The harbour is the central point of the town because even today Blanes is still a working fishing town. The fishing boats set off early in the morning and return in the late afternoon/early evening with their catch. You can buy fresh fish at the fish market by the quayside. The promenade is also one of Blanes’s best attractions and landmarks. Just behind the beach it is very popular with the locals in the evening for their traditional evening stroll. Behind the promenade are many of Blanes’s best restaurants, cafes and bars. For the energetic try walking along the Blanes coastline to the rocky promontory known as Sa Palomera. You will reach the lighthouse with spectacular views back overlooking the town of Blanes. One of Blanes’s most famous sights and attractions are the stunning Marimurta Botanical Gardens to the north-east of Blanes. Founded in the 1920’s by the famous German industrialist Carl Faust, the gardens contain around 3,000 plant species. The gardens are divided into three zones with unique themes such as subtropical, temperate and Mediterranean spread over four hectares. The Pinya de Rosa tropical gardens are on an area of 500,000 km’s on the outskirts of Blanes. This is one of the largest collections of living cactus in Europe with more than 7,000 species from all over the world. Also close to Blanes and definitely worth a trip out if you are on holiday with your family is the Water World water park near Lloret de Mar. It is a great fun day out and there is a free bus service departing from Blanes. Between Blanes and Malgrat de Mar is Marineland, a combination of marine zoo and water park. Here you can see dolphin shows, sea lions and flamingos. Marineland provide a free bus service departing from Blanes. Address: Ctra. Malgrat a Palafolls, Palafolls, telephone 93 765 48 02. Consider also day trips to the livelier tourist resort of Lloret de Mar with its active nightlife and shopping opportunities as well as many good beaches and sights. For excursions further afield a must-do sight is a day trip to world-famous Barcelona or historic Girona. Explore the Cava (Spanish champagne) region of Sant Sadurni to the west of Barcelona. There is a world-class theme park called Universal Studios Port Aventura about 140 kilometres south of Blanes near Tarragona. This has great rides and roller coasters making this is a memorable family day. There are lots of different accommodation options in Blanes, mainly hotels (mostly in the tourist district of El Pins) and lots of apartments (40,000) for rent. Outside of these there are also villas for rent as well as pensions, apart-hotels, hostels and twelve camping sites. If you are stuck try the local tourist office and they will help you find accommodation in Blanes. For hotels, Blanes has three four-star hotels, six three-star hotels and two two-star hotels with nine guesthouses. Working our way south to north first we have the nudist beach known as Los Pinos (playa naturista/nudita). By the way the Spanish word for beach is playa although in Catalonia they have their local language/dialect called Catalan in which beach is Platja. Then the longest beach on the Costa Brava called Platja (Playa) S’Abanell. Then the main beach of Blanes in the centre of town, situated between ‘the rock’ (Sa Palomera) and the harbour, this beach is called Platja (Playa) de Blanes. Then the rocky beach of Playa dels Capellans y Punta de Santa Anna, followed by the Cala (cove) de Sa Forcanera and then another cove – Cala de Sant Francesc. Further north outside of Blanes there is the Playa de Treumal and the Cala de la Boadella another naturista/nudista spot. These are blue flag beaches which mean they meet the highest European Union quality standards. There are plenty of sports and activities on the beach such as beach football, volleyball, kite flying and kite surfing, as well as water sports such as snorkelling, scuba diving, sailing and windsurfing. Famous buildings, landmarks and tourist attractions in the old town of Blanes include several historic monuments, including a 15th century gothic fountain and a parish church which dates from the 14th century. Much of this original church was destroyed during the wars against France, although the square tower has survived. The weekly market in Blanes is held every Monday morning. You can buy everything from fruit, vegetables, jewellery, shoes, leather goods and clothing. Many of these are locally made by craftsmen. Souvenir shops and designer boutiques can be found in the centre of Blanes. The fruit and vegetable market in the Passeig de Dintre is open every day from Monday to Saturday. There are many good restaurants (over 150 restaurants) and bars in Blanes most of which are located along the beachfront promenade (Passeig de Cortils i Vieta). Try also the area just behind the promenade (Passeig de Dintre) which also has many good restaurants that only the locals know about. As you would expect with Blanes being a working fishing port, seafood dishes are the best choice. For some local specialities try the Blanes prawns, fish stew (Suquet de Peix) and Anchoas al Estilo de las Medas (anchovy dish). Of course for dessert you have to try the local equivalent of crème caramel known as Crema Catalan. Dining out and eating out is good value for money so look for self-catering accommodation, perhaps looking to rent an apartment, for your holiday to Blanes so you can enjoy the local cuisine which as well as local Catalan dishes also includes Italian, Mexican, Dutch, Greek and Chinese. 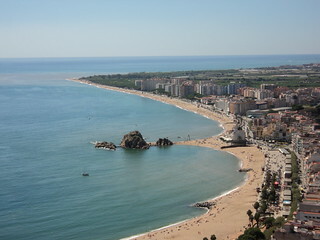 The weather and climate in Blanes is very good making for an excellent summer holiday destination. Its summers are hot without being extreme such as in other areas of Spain such as Costa Almeria and the Costa del Sol. Expect July and August to have average highs of 29°C (82°F). The winter in Blanes can certainly be cold due to its northern proximity (Blanes is very close to France), average highs are 13°C (55°F). Blanes does experience a lot of rainfall compared to the rest of Spain. Located in the province of Girona to the south of Blanes is Camp de les Meves, then Malgrat de Mar. To the north of Blanes there is Santa Barbara, Santa Christina then the huge tourist resort of Lloret de Mar and further north is the equally large resort of Tossa de Mar. Public transport with buses in the resort is cheap and efficient. There are buses from Blanes to Girona, Girona Airport and other resorts on the Costa Brava, including Lloret de Mar. There are also regular trains to Barcelona in the south. As Blanes is halfway between Girona and Barcelona (60 kms to Barcelona from Blanes) you can access Blanes from either airport. Girona airport now has low-cost airlines such as Ryanair flying there. Barcelona airport is also accessible with many destinations from all over Europe. Airport transfers from Barcelona airport or Girona airport can be arranged. In Blanes itself there are plenty of local taxis. Below we have an interactive guide and map of Blanes for visitors and tourists visiting the seaside beach town of Blanes on the Costa Brava coast of Spain. Where is Blanes? Where is Blanes located in Spain? What is the nearest airport to Blanes? How do I get to Blanes? Where can I find driving directions to Blanes? Where can I find a free streetmap of Blanes? Where can I get a hotel map of Blanes? There are no local car hire companies in the town of Blanes that we are aware of or would recommend. It is best to hire a car from either Girona airport or Barcelona airport. Otherwise there are many good car hire companies in nearby Lloret de Mar and they will collect you from Blanes to their offices. We must say that transportation links with Blanes is very good so you don’t have to have a car but it does give you the flexibility to just pick up and go when you feel like it to the areas many attractions such as Barcelona, Girona, the theme parks such as Universal Studios Port Aventura and water parks such as Water World. For an instant car hire quote for Blanes try our unique price comparison car hire seach engine which searches and compares the cheapest car hire rental rates from national and local car hire companies in the Blanes area. As usual with any town in Spain, Blanes loves its fiestas (festivals) with many days (and nights) of music events, dancing, fireworks and much eating and drinking. The most famous celebration for Blanes is the annual fireworks contest held at the famous rocky landmark of Sa Palomera. This is held in July and dates back to the early 20th century, attracting people from all around the world, all hoping to get their hands on the coveted Blanes Trophy. There are no golf courses in Blanes itself and to be honest the area is not renowned for golf lovers. The best areas in Spain for golf would be the Costa del Sol and also the area to the south of Alicante on the Costa Blanca. Spain. Telephone: 972 365 416. Further afield try the golf course at PGA Golf de Caldas, Apdo. Correos 60. Ctra. Nacional II, km 701 Caldes de Malavella, 17455 Girona. Telephone 972 472 959. Address: Paseo Catalunya 2, 17300, Blanes (Girona). Opening Hours/Times: From April to October 9am – 9pm. The tourist centre office in Blanes can help you will local information such as maps, guides, brochures, help with accommodation and they can answer any questions you have about dates for festivals, fiestas, weather information, transport and transfers to Blanes. Another Blanes official tourist information center is located at Pins Office in Plaça dels Campings, open from June to September. 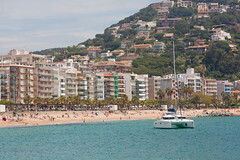 Blanes Tourist Information – Page Summary – This page contains unique content about the beach resort of Blanes, a popular tourist destination on the Costa Brava coast of Spain in the region of Catalunia. Please help us to make this the number one tourist resource for Blanes by adding any comments, reviews, ratings and feedback on any aspect of Blanes that you know about. We also welcome your photos, pictures and videos of Blanes for posting on our website. I am looking for info in relation to parking in blanes. We intend travelling at end of June. Is there on street parking is it expensive. Don’t leave your bike anywhere even locked up. especially near the fishing port. My husband had his stolen. It was locked up, but the rotten thief cut through the lock and got away with an expensive bike that we cannot replace. The police were called but the CCT camera that would have seen the thief was not working. How convenient. We like visiting Blanes but won’t ever again…..